Rick Sanchez spent the last year wandering through the wilderness. But the former CNN host used his time creatively. He had the chance to reflect, re-energize, and re-engage. And, along the way, Sanchez discovered a new and exciting world. And, to go with it, a new language: Spanglish. Not that kind of Spanglish. Not the intermixing of English and Spanish to create a new dialect. Rather, what gets Sanchez’ blood pumping these days is the intertwining of two cultures to create a new cultural distinction. It’s the future, folks. And Sanchez wants to be our guide. He may just get that opportunity along with many others he’s being offered in business, media, and entertainment. He is going places---again. It’s likely he’ll be in our living room---again. But he doesn’t ever again want to make the mistake of putting all his eggs in one basket. Instead, he wants to gather them up and spread them around. 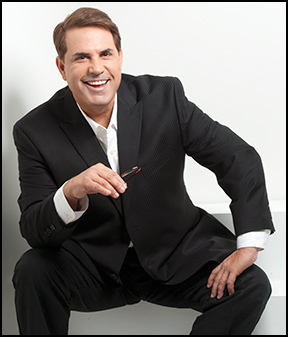 Fully bilingual in English and Spanish, he might end up hosting both radio and television shows in both languages. Or producing and lending his voice to documentaries. Or creating television news shows. Or writing another book. Or helping to create a new television network aimed at Latinos. He’s going to need more baskets. There is much to share. But, first, there is the matter of that infamous radio interview in October 2010 that closed a door but opened his eyes. Sanchez was trying to tell us something during that conversation on Pete Dominick’s Sirius/XM radio show. He wanted to say that, even for those Latinos who work hard enough and are lucky enough to land what seem to be great jobs in the media, the experience is sometimes not so great. But Sanchez was interrupted---by misconstrued comments that some considered anti-Semitic, the lightning-quick firing by CNN, six months of introspection and meetings with Jewish organizations to learn about American Jews, and six more months learning Spanglish. Boom! I used to appear on Rick’s List, Sanchez’s show on CNN, and, when all this happened, I wrote a couple of columns. I lamented the whole affair, but I also gave Sanchez respeto for always going to bat for Latinos. There he was, debating his one-time colleague, Lou Dobbs. Or challenging those border vigilantes, the Minutemen. Or dispelling the lies that get told about Latino immigrants. He deserved credit, and I gave it to him. Recently, we unpacked what happened at CNN, and then moved forward into a discussion about what happens from here. When he mentions the word “diversity,” my friend lights up like, well, a television set. And exploding in numbers. According to recent analysis of 2010 Census data by the National Council of La Raza and the Pew Hispanic Center, every month 50,000 U.S.-born Latinos turn 18 years old and thus become of voting age. The people in this younger and more assimilated demographic deserve a lot of attention. But they’re not getting much. By now, I’m intrigued. So I asked him: What does this group look like? What does it think? What are its values? He admits that, until recently, he had no idea that it even existed. It’s an animal that Sanchez wants to give voice to, and provide news for, and introduce to the rest of America: “I’ve been meeting with politicos on both sides of the aisle,” he said. “These are presidential candidates, congressmen, local officials. I’ve also been having meetings with members of the media, who, to their credit, want to better understand this developing trend, which seems to be passing most of them by. While Sanchez maintains that, for the most part, this epiphany came to him once he left CNN and had a chance to catch his breath, he also acknowledges that the seeds might have planted with something he became known for while working at the network. He was one of the first television anchors to incorporate Twitter, Facebook, and other social media into his newscasts. And it allowed him to communicate directly with viewers, many of whom were Latino. Sanchez hears those people, and he wants the new opportunities he has been offered to amplify their voice. It’s something he thinks will benefit not just those who want to have a say but the entire country. Listen to the man. He’s right. Get in the game. Fight to have your say---in whatever language you want to have it. Media, like politics, is a contact sport. Take part, or get taken apart. Rick Sanchez, son of Adela and Paco, is getting back in the game. He still has a lot more to say, and a new set of opportunities to say it in ways that are engaging, enlightening, and empowering. And this time, it’ll be on his terms---with no borders and no apologies. Ruben Navarrette Jr. is a syndicated columnist with the Washington Post Writers Group, a contributor to CNN.com, a commentator on National Public Radio, and author of A Darker Shade of Crimson: Odyssey of a Harvard Chicano (Bantam).